UMW faculty are constantly coming up with great ideas, and Warren Rochelle is no exception. This morning, Warren came to the DTLT to talk with me about a Fantasy Writing course he’s teaching in the Fall. In addition to creating a world and framing it out via writing, Warren will be asking his students to create an accompanying website that summarizes and clarifies information in their writing (e.g. a dramatis personae) and also provides new information to stoke readers’ imaginations (e.g. a map of the world they’ve created). Fantasy fans have been creating websites for their favorite fantasy novels and series for decades, so it’s really cool that’s he asking them to explore and take seriously the genre’s formal and informal/community-based structures. We’ve got a pretty great structure for this, I think. Similar to the work I did last semester with Sue Fernsebner on her course’s Taiping Civil War site, we’ll have a single domain for the course. Warren chose WoodBetweenTheWorlds.us; much like its namesake in the Chronicles of Narnia, the central site will be the portal for exploring and moving between the worlds created by the students. Each student will have their own subdomain (e.g. http://story-name.woodbetweentheworlds.us). Even though they’ll be under the umbrella of the course domain, they’ll have complete freedom to install any software packages — WordPress, a wiki, discussion forums, etc — and to adapt the site to visually fit the atmosphere of their story’s world. We did discuss the possibility of having each student work on their own domain, but for this project we agreed that it was important for the worlds be part of a larger community, one which will continue to grow as this course is taught in the future. Besides, as Warren pointed out, when their site is done they’ll be able to package it up and host a duplicate copy of it on their own domain. It’s the best of both worlds. 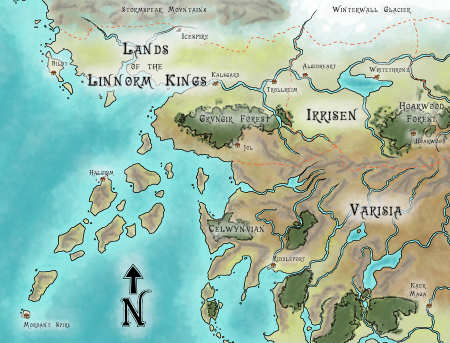 “Map – Golarion – Up Northwest” by Ashton Sperry. CC BY-NC-ND 3.0. For further (more famous) examples, check out the original artwork Daniel Reeve created for films like The Chronicles of Narnia, The Lord of the Rings, and The Hobbit. These are writing students, not necessarily artists, so the trick in supporting this part will be finding a tool that allows students to be creative, without bogging them down in the technology. I spent the bulk of my day today doing research on fantasy cartography tools, with a little help on Twitter from Sonya Coleman, as well as UMW’s own Andréa Livi Smith and Lisa Ames. Here’s the initial list of resources I pulled together, along with my notes on each. Photoshop + a Wacom tablet, for those who actually do want to draw them by hand and then edit. Campaign Cartographer 3, a fantasy cartographer favorite that allows students to create beautiful maps. It’s not free, so we’d have to figure out how to make it available to students. It’s also PC-only, and has a pretty steep learning curve. AutoREALM, a free and open-source role-playing game mapping software. PC-only, and it looks like it may have a bit of a learning curve. Hexographer free version, a fairly easy-to-use mapmaker based on hexagons. Not as pretty, but an easier learning curve so that students can focus on creating the world, as opposed to the technical parts of mapmaking. Free, available for PC and Mac. Fantasy World Generator, allows students to select a few options and have a hex-map randomly generated for them. Icosahedral World Map Generator, another hex map that’s easy to use and available for PCs and Macs. Stone Sword World Maker, a square tile-based free and web-based tool that’s very easy to use. TIAMAT, another square tile-based web-based tool. It’s free to build but costs $$ to export and use elsewhere (about $1/map when purchased in a pack of 25 exports). Pretty Dungeons & Dragons focused, but some good geographical tiles as well. Wizardawn, an old-school 8-bit style map generator. Free Fantasy Maps, a lot of these maps are Creative Commons-licensed so available for either inspiration or use. Gozzy’s Cartographic Emporium, maps for inspiration or use (although some of them are far too small to be useful). NBOS Online Exchange, maps for inspiration or use. Dundjinni User Art. A lot of this is for Dungeons and Dragons-type visuals, but there may be a few things of value. Obviously we still have a lot of work to get this up and running, but so far we’re off to a great start. Get in touch if you know of WordPress themes and plugins that might be useful in creating these sites, resources that would be great inspiration for the students, or other suggestions for how to make this project even more awesome!